A 21-year-old woman in Portland, Oregon, has been catching a lot of grief over an incident concerning her boyfriend and a newly bought 32-year-old-horse. Jasha Lottin, (the girl in the photographs below) and her boyfriend, reportedly told investigators that they wanted to humanely kill the horse, which was declining in health, and eat it. She continued to explain how she wanted to feel what it would be like inside the corpse of the horse. After the animal was fully gutted, Lottin striped down and crawled inside and posed for photographs inside and out holding organs while covered in blood. She can’t seem to understand all the attention she’s been getting and “No idea why people care,” Jasha Lottin, told Seattle Weekly, which published the photos of the carnage that she posted on the Internet. Personally, I have seen weirder things, but still, it gives me the creeps. To me it seems like a really misunderstood revisioning of “The Empire Strikes Back”. 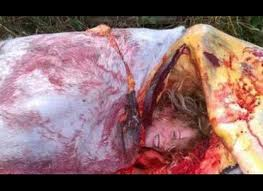 21-year-old Jasha Lottin, naked, and twisted, inside the corpse of a horse. This entry was posted on November 6, 2011 by David Joseph. It was filed under Strange Reports and was tagged with Dead horse, Empire Strikes Back, Jasha Lottin, news, Oregon, Portland, The God Father.